The whole stretch of the year from September through to January in Florida has wonderful dusky light and silhoutette sunsets, perfect weather for excursions to the Magic Kingdom - which rarely ever looks better than in the waning hours of sunlight in the waning year - and which seems now especially suited to visits to the Haunted Mansion. There may not be autumn leaves blowing like they have in New England where we lay our scene, but this is a perfect time to experience this most complex of attractions. So it is perhaps natural that our thoughts turn towards the Mansion as the month rolls onward towards All Hallow's Eve. Today I would like to direct your attention towards one of the least respected and most frequently dismissed aspects of the attraction: the lowly pop-up ghoul. There is not much love in the world for these minor inhabitants of the spirit house. 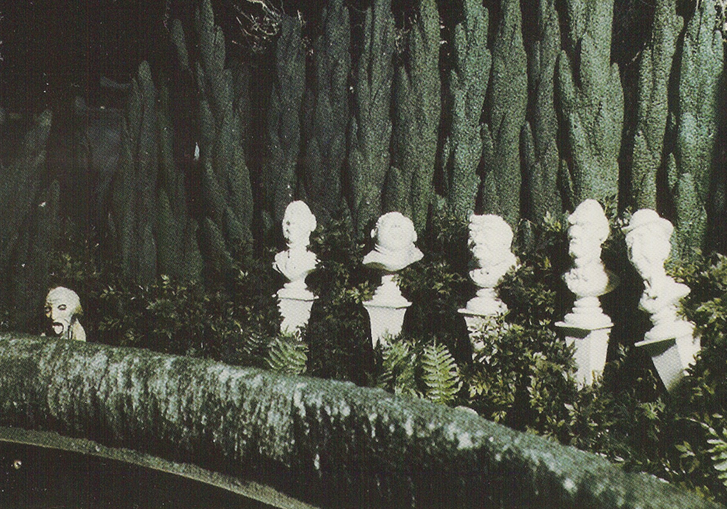 For one, they are not a special effect - the Haunted Mansion's true stock in trade, of course. 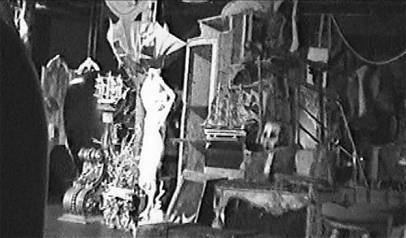 Second, they are relatively close to the spookhouse apparatus which had been as of 1969 haunting local amusement parks and fairground Ghost Trains and Wacky shacks for around 40 years. Me, I'm obsessed with them. To begin with I, for one, see no harm in pointing out that Disney appropriated certain established aspects of a very rich American tradition of amusement parks, a rich American tradition which is all too often ignored in studies of Disneyland and her progeny. Just as Mr. Toad's Wild Ride and especially Snow White's Adventures took the form of dark rides not unlike any number of non-Disney spook houses, the familiar presentation is part of what helped frame the audience's expectations for these attractions. 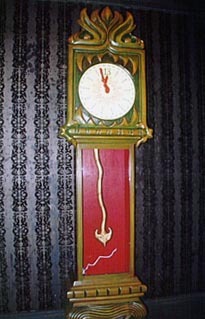 Both Mr. Toad and Snow White were beautifully mounted experiences in a genre they helped disband. To cite another example, the 1971 Jungle Cruise kicked off with a leafy variation on the traditional Tunnel of Love, and of course the trip behind the waterfall introduced in 1955 at the Disneyland version had been a stock in trade for Dark Rides for generations - Coney Island's "Spook-A-Rama", predating Disneyland, pulled the same trick. It is where these Disney attractions connect to a larger native tradition of amusement parks, World's Fair, Amusement Piers, Atlantic Cities and Coney Islands that the difference between what Disney did and the rest of the world did becomes most evident. Anyone who had actually boarded a spook house at a local carnival would immediately see and understand this world of difference. The funny thing is that Disneyland and The Magic Kingdom are places where these established traditions, expanded and elaborated, could have lived on. Coney Island is but a pale shadow of her former glory, and rare is the person today who has actually been on a real Wacky Shack or Phantasmagoria at their local amusement park. The Disney versions have driven the originals to the verge of extinction, and today the points of connection between the Disney tradition and the earlier traditions are often our only point of connection to a larger, and vanishing, world of American Entertainment History. So, yes, the difference between what WED Enterprises did and what these small companies operating out of the East Coast and Midwest were able to accomplish is staggering, but continuing to exclude the heritage of the American Dark Ride - as American an invention as Coca-Cola - from the history of the Disney version is foolish. To begin with, Disney did not invent the ride through attraction any more than he invented the Ferris Wheel or roller coaster. But most importantly: what you gain by insisting on the independence of the two schools - the home brew paper mache one and the big Hollywood industry version - is insubstantial compared to what you lose. It's over sixty years of precedents just gone in a flash. So yeah, in the Haunted Mansion, those pop-up ghouls are just masks on sticks. What of it? It isn't the trick itself that matters here, but its presentation in a larger context I'd like to dwell on. This is where our pop up ghosts appear. 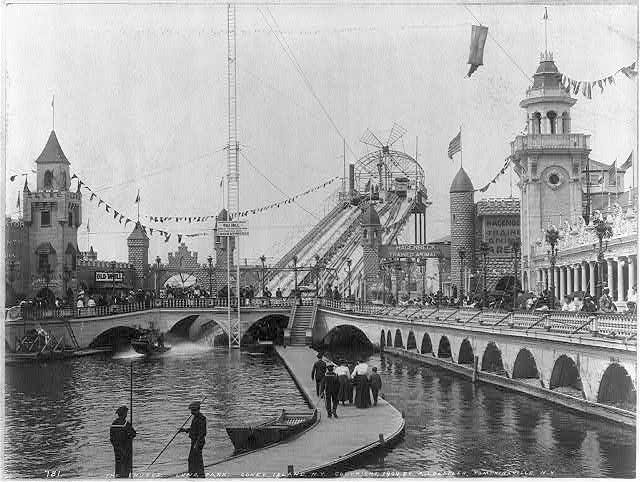 The first company to create what we essentially know as the dark ride was Pretzel Amusement Ride Company of Pennsylvania, whose signature attraction "Pretzel" was a long, winding, disorienting trip through darkness which did not yet have things jumping out at you, but instead often simple gravity-operated gags creating crashes, bumps, and thumps. When there were visuals, these were things like donkeys kicking their hind legs, befuddled cops, and mice running along a shelf, knocking over bottles. 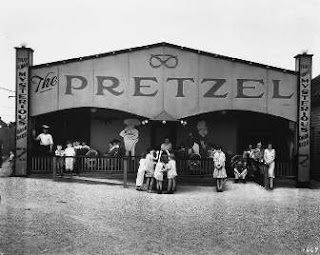 These experiences were more about disorientation and absurdity instead of suspense and horror, which is why their signature and namesake attraction, The Pretzel, became known as Laff in the Dark. The fellow on the left was the "Jersey Devil" stunt, a simple paper mache head impaled on a rod, and the Pretzel Company's highest seller. When the car would roll near the Jersey Devil's box, the wheels would depress a lever set in the floor which would both send the Devil shooting up on his pole and connect an electrical circuit causing his light to turn on. When the car rolled away, the lever would reset and the light would turn off. You should recognize the fellow on the right, he's related to the Jersey Devil but indeed not far removed from our own frame of reference. This gag was realized at Disneyland pretty much exactly as Gracey illustrated. 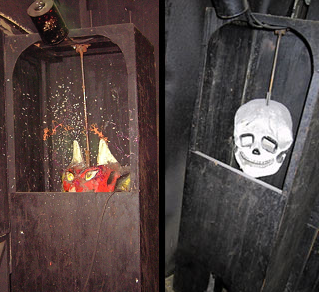 Disneyland lost two of their "Rocket Skulls" in 2006. 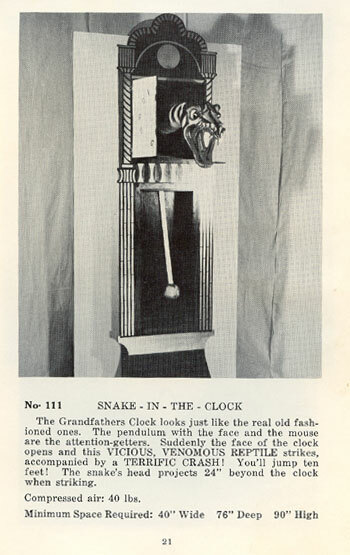 They leapt out of hatboxes in the Attic, a holdover from the bad old Hatbox Ghost days, and it's very likely that Gracey took his inspiration directly from a Pretzel Amusement Company stunt he saw in his own life or in a catalogue. It's unique gag, and unique to the Disneyland Mansion - I've never found any real evidence that it was replicated for the Florida version. There's one left out in California in the Graveyard scene in front of the Tea Party. The simple fact is that you can wander Disneyland for many hours and not stray too far from what enterprising people like Leon Cassidy were cooking up back when Mickey Mouse was still making a name for himself. Disneyland is intimately woven into the fabric of this cultural history. So what separates the pop-up ghouls in the Haunted Mansion from the Jersey Devil lurking in the dark corners of some Pretzel ride seventy years ago is context. 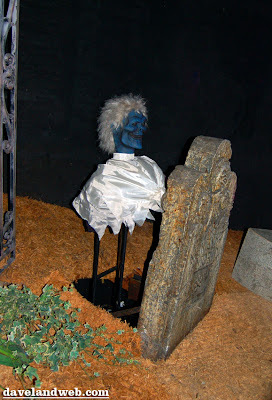 Unlike rides with names like Pirate's Cove and Laff in the Dark, the Haunted Mansion seems to pull all these disparate elements together into a tightly woven tapestry which combines a lot of distinct ideas, styles and methods into a single unified whole, something which has structure and life. Even those pop-up ghosts have meaning and form, you know, and I'd like to demonstrate why these simple gags deserve your respect. These photos were excluded, I think intentionally, from the Florida version of the show, although they did belatedly appear on the East Coast in 2007. You'll notice there are really only four heads. From left to right we have Winky, Hook Nose, Droopy Eyes, and Bug Eyes. They're all sculpted to appear to be screaming. Here's what each looked like in situ in the Disneyland Mansion; I've pulled each of these from Disney promotional films so there's no cheating. Generally, the majority of the Disneyland popups still have "shoulders" and wigs, even if the wigs today are are white close cropped affairs. They still have white shirts for bodies, which are a reasonably good approximation of burial shrouds. 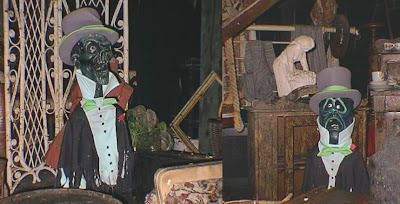 The Florida versions only used shoulders and white shirts in the Attic scene prior to it's 1996 "upgrade"; the Graveyard figures all have simple black cones of material to hide their mechanics. Also, this may be a trivial point, but the Disneyland versions tend to rise and then retreat immediately. Over the last forty years as the pneumatic pressure which runs the mechanisms has been reduced, they tend to rise much more slowly and drop out of sight quickly, giving a "peek-a-boo" effect. The Florida versions still rise quite quickly and tend to stay in their raised position for a second or two before lowering out of sight, much more of a shock effect. Again, I have no idea if this is intentional. For whatever reason these four faces are weirdly spliced across the two Stateside Mansions, with Droopy Eyes appearing only at Walt Disney World and Bug Eyes exclusive to Disneyland. I have no idea if Droopy Eyes has never appeared in California, if the heads were worn out and eventually replaced, or if there were other factors leading to the current arrangement. I'm not pointing all this out to be pedantic but to establish that far from being careless "scare-em" afterthoughts to the texture of the Haunted Mansion, these simple gags were carefully thought out and integrated into a fully realized environment. In fact, the pop-up ghouls are a far more important part of the attraction than they currently appear to be. Mansion Specialist HBG2 has already written extensively on the way these pop-ups were used in the original version of the Disneyland attic to suggest a connection between a mysterious bride figure and her phantom suitor with a vanishing head; what was already an implicit connection due to the figures being linked by a phantom heartbeat was made even more on the nose by having - at two other places in the Attic sequence - skulls emerging from open hatboxes amongst the junk. 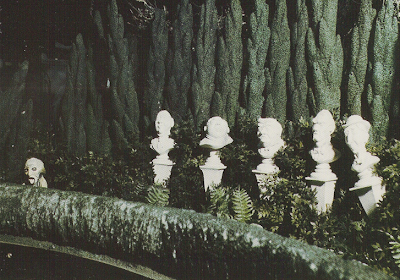 Decapitated heads stuffed in hatboxes is a pure murder mystery gothic horror tropes, the same tropes the Mansion traffics in to create much of its meaning. And what about those other pop-up ghouls? They popped out of trunks. Even in Florida, where there never was a Hatbox Ghost for the bride to menace, the connection was perfectly clear. Dastardly deeds were afoot in this house long before the other ghosts moved in, deeds seemingly confirmed by the presence of the ghostly bride. Bodies stuffed in trunks forgotten in the Attic is as firmly established a gothic tradition as phantom lovers, and indeed in some folk stories these two strands intersect where the phantom bride is trapped in and suffocates inside a trunk. The Attic always seemed to be the dark heart of the attraction, the room you were never supposed to see where the secrets were hid. It is the only part of the attraction where you are without the Ghost Host, who leaves you while you unwittingly uncover the scariest room in the house. This was confirmed by the sudden appearance of the apparently malicious leaping ghosts and the mournful, mysterious bride. After passing through this room, we flee from the house through a window - as clear a sign of escape as you can ask for - and stumble into the graveyard party to rejoin our host. The room is supposed to be a turning point in the attraction. All these ideas circulating in the undergrounds of the Attic scene were what gave it its deep resonances, ideas which are to some extent still present but now explicitly spellt out for us with big signs and narration in the new Attic show. Furthermore, the new version of the Attic is just another gag sequence, it isn't dangerous or scary. The pop up ghosts and their piercing screams were our indication that things were getting serious in the old house on the hill, and ever since their removal the spark has seemingly gone out of this central sequence in the ride. Okay, so I've established the importance of the figures, the excellence of the accomplishment of the effect, and the important role they played in the Attic sequence. But the pop-up ghouls have been silenced at Walt Disney World since 2007, and since 2006 at Disneyland. What about the ones left down in the show's big climax, the Graveyard jamboree? Their relevance lies in a matter of structure. In the original versions of the show at Disney and Magic Kingdom, the Attic pop-ups came up all at once, which was certainly nerve wracking and loud, creating a din that could be heard as far back as the start of the Ballroom scene. 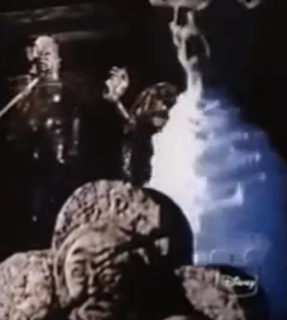 Both coasts also share a feature of timing in the Graveyard scene: each ghoul rises all at once at the conclusion of each verse of "Grim, Grinning Ghosts". It still is this way, but the reasons why this happens is our clue to unlocking the secret of the importance of these figures to the larger Graveyard scene itself. Rise as spooks of every size! Seem to be describing things have have happened or will happen on the attraction? Observant riders will see plenty of creaking crypt doors and quaking tombstones and rising spirits in the Graveyard scene and of course the reference to spooks sitting by your side needs no explanation. Ironically X's own lyrics help discredit his famous assertion that the Hitch-Hiking Ghosts were a last-minute addition! Start to look suspicious. There's plenty of harmonizing happening in this "Screaming Song", but shrieking? This isn't just a nice picture of the Graveyard band; it contains an important detail. Notice that gravestone in the lower left side? How there's a speaker built into it? You've probably already put it together by this point, but yes, it's true, in the early years of the attraction - for about the first decade, in fact - each Graveyard popup would loudly scream or shout as they rose. 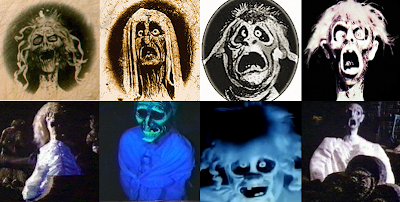 Since Grim Grinning Ghosts is called The Screaming Song, they quite naturally scream between verses as a sort of punctuation. 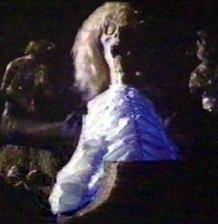 In addition to "vocalizing", each pop-up once had it's unique lighting; you can see it in the picture of Winky above, faintly causing the white "body" of the ghoul to glow blue. From the original WED model. This repetition allows there to be some formal continuity between each cluster of ghosts in the graveyard. So these ghoul pop-ups aren't just cheap scares throughout the scene, they were actually the thing that structured the Graveyard finale, a unifying thread just as much as the song. When I worked at the Florida Haunted Mansion, I spent a good deal of time under the Graveyard with flashlights and old maintenance books trying to determine positively that there were once individual lights and sound effects for these ghosts. There was only minor evidence left. I believe that the lights are supposed to be off when the figures are at rest, turn on for the ascent and descent, then turn off again. This would mean that each figure would be "invisisble" in its lowered state. Sometime after these effects seem to have been retired in the early 1980s, and with the apparent reason for the pop-up heads to be present at all now gone and fading from memory, Imagineers began to tinker with the Attic sequence and the pop-up heads began to suffer a number of indignities. In 1995, to go along with a reworked Attic, Disneyland ditched their screams and added ghostly echoes of "I Do", as well as a fancy new shadow pianist plunking out the Wedding March. The timing of the leaping ghosts was adjusted: no longer rising all at once, they would jump out in sequence from the back of the scene to the front. The shouts weren't all bad, some of them were pretty creepy, but the menace of the scene was radically undercut. Additionally, the adjusted timing now made it possible to ride through the entire Attic and not see a single pop-up ghost, a feat I accomplished several times. Previously, the screams and imagery of heads in hatboxes and bodies in trunks bespoke an atmosphere of dread that rubbed off on the silent bride. 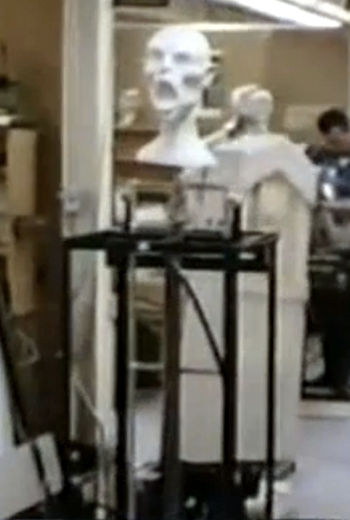 Now the ghosts at the piano and hiding in the junk seemed to be mocking her. Is the bride a hero or a villian? 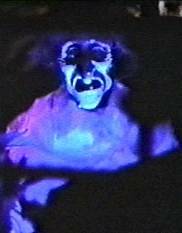 In the original formulation of the scene, she had decapitated the Hatbox Ghost and probably a few others too. Not only that, but her face was a freaky skull that tended to scare the bejezus out of riders. In later years, the figure became mysterious, then eventually sad and oppressed. Reconfiguring the attic ghouls to shout "I Do!" radically altered their meaning - which ought to be enough evidence of their importance - although the actual staging of the scene was kept more or less the same as it had been in 1969. 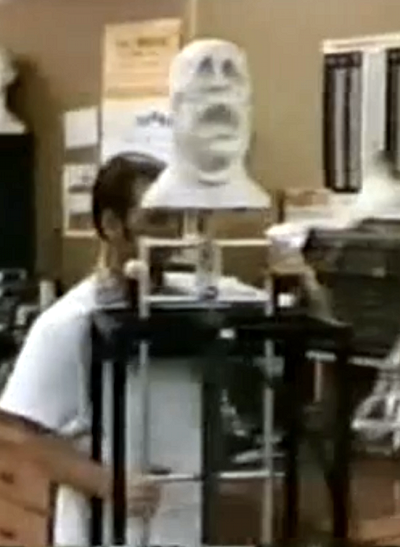 Walt Disney World took a different route to revamping their bride in 1996. It sounds okay on paper, but as you can see the cartoonish costumes leave something to be desired. But the worst offense was the removal of the boxes and trunks these figures would leap out of; for all except two of these figures all that was required to spot them before they would rise would be to lean forward a few inches. Winky, on the left up above, could be clearly seen "hiding" near the floor right as the buggies ascended into the Attic. It didn't make the scene any less loud or scary, although it was now a good deal more transparently lame. Why bother at all? The figures themselves followed their hiding places to the great beyond in 2007. Today, the only place where something like the original Attic can be seen is at Tokyo Disneyland. Although their ghouls rise sequentially, they still scream, emerge suddenly from boxes, and foreshadow a menacing ghost bride. I think we should care about these pop-up ghouls because they were, like everything else in the attraction, conceived with a purpose. 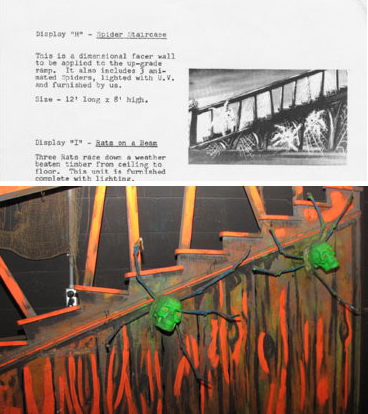 They drew on spook house traditions to further both the atmosphere and design of both of the scenes they appeared in, creating effects and ideas that were far more advanced than the limited technology they represented. Plus, they were scary. What was once the dark heart of the attraction's mystery now seems fairly tame compared to even the minor scenes which open the attraction. While the Black Widow Bride Attic represents a significant advancement in technology and especially set dressing than its forebears, it isn't really scary. The sense that the stakes are being raised now that your Ghost Host has left you is gone. 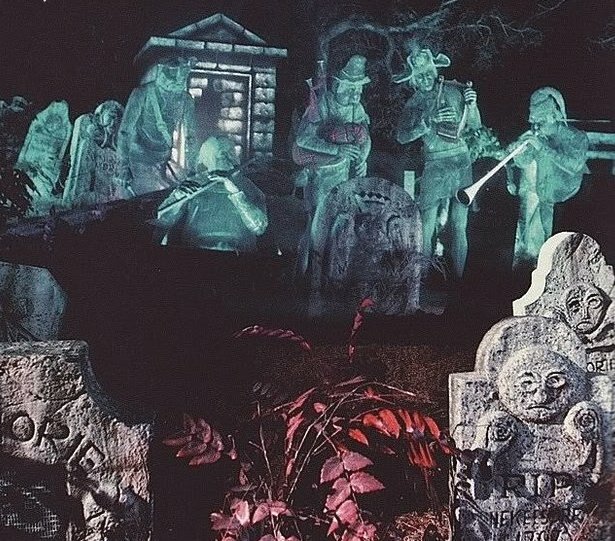 While The Haunted Mansion is no slouch in creepy ideas and images that can get to you late at night, the pop-up ghosts represent the only really scary thing in the whole ride, the only thing that could make you jump. That they appeared only in the final leg of the attraction was significant and speaks to a structural progression which was carefully thought out and artfully realized. They may represent a sort of base fairground level shock, but I think they were about the right amount of scare for an attraction which is, after all, called The Haunted Mansion. In that name that there is a promise which - at least partially - is no longer being delivered. I think it's time to restore this particular long-lost effect to dignity. The Florida pop-ups that remain still have their individual lights but these lights should be made to turn on and off at appropriate times. Their gravestones still have holes cut in them for speakers to facilitate their original shrieks, grunts, and groans. In fact, having been under the graveyard to investigate, I can attest that at least as of several years ago most of the wiring is still intact. And, of course, it would be nice to see these figures treated to a bit more loving care - with appropriate wigs, facial details, and bodies. Maybe then, once the true intentions of the people who, after all, designed the attraction are made apparent, this minor but important feature of the Haunted Mansion show will finally be given the respect it deserves.